This is the fourth of 7 “scenes” depicting each of the pieces of the armour mentioned by the apostle Paul. Putting on the whole armour of God protects us in the battles of life & faith. This was actually the first illustration in this set that I drew. I enjoyed drawing the fiery arrows & designed them to look dark & menacing. If you look closely you’ll see that each arrow head has a different design. perhaps indicating that it is a different thought or idea, hurled at us by the enemy, Satan. I liked adding the cross to the shield, with it’s radiating lines of colour. The red on the shield indicates Jesus’ blood, shed for our redemption on the cross. Notice that not a single arrow has got past the shield – that’s a comment on the power & steadfastness of the Shield of Faith! Notice also that the flames on the arrows that are sticking in the Shield are dying – showing that the Shield extinguishes those fiery arrows & renders them useless & ineffective against us. Shield of Faith: what is it & what’s it for? Lift up over all the [covering] shield of saving faith, upon which you can quench all the flaming missiles of the wicked [one]. From these references we can see the Shield of Faith as a powerful defensive device. It provides excellent protection from the attacks (the fiery darts or arrows) of our enemy, the Devil. In addition, the Shield of Faith protects the other parts of the Armour of God, just as a Roman soldier’s wooden shield did so. Vegetius wrote (in the above quote) that every soldier in a Roman legion wrote his name on his own shield. 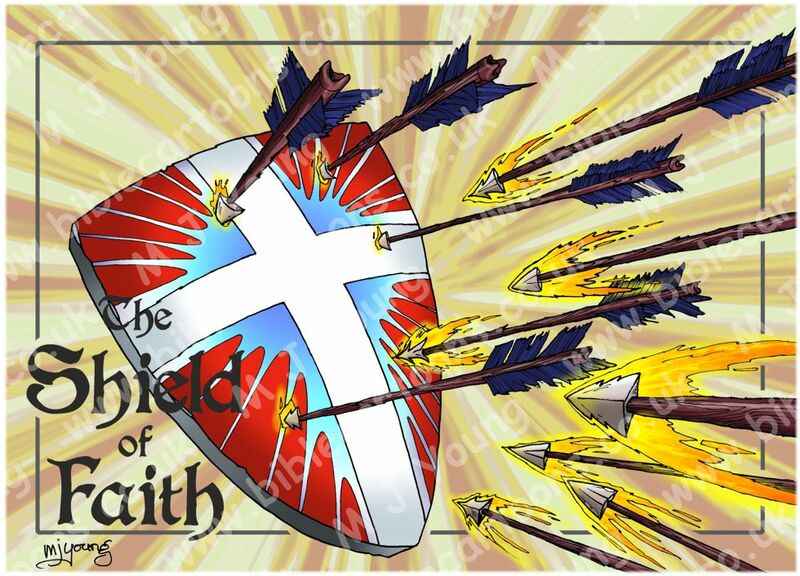 Perhaps if we similarly personalise our “Shields of Faith” we will come to love our own faith more, & be all the more ready to wield it. Application: why a Shield of Faith? From these references we can see the Shield of Faith is a powerful defensive device, just as a Roman soldier’s wooden shield was. It is a Christian’s faith which protects him or her, especially in the battle for our minds: with doubts, fears, anxieties, etc all being thrown at us from the enemy of our souls. Hebrews 11:1-2  tells us what faith is: trust in the existence of God; this faith is the firm foundation for our lives as Christians, it underpins everything that makes life worth living. It’s our belief & confident assurance in that which we can not see with our senses: the spiritual realms; spiritual truths. Hebrews goes on to give a long list of people from the Old Testament who did amazing, miraculous things, utilising the power of their God-given faith to achieve them. Indeed, faith is a central theme running all the way through the Holy Bible. Back to the military metaphor of our Shield of Faith, it may even provide additional protection for other people (Christians or unbelievers) in the same way that Roman soldiers locked their shields into a whole, multi-shield defensive structure, which provided excellent protection for an entire unit of soldiers. When the church of Christ comes together to work as a unit, with Jesus Himself directing our efforts, we are certainly a mighty force for good, capable of achieving more than any one individual might hope to achieve. 1 NOW FAITH is the assurance (the confirmation, the title deed) of the things [we] hope for, being the proof of things [we] do not see and the conviction of their reality [faith perceiving as real fact what is not revealed to the senses]. 2 For by [faith—trust and holy fervor born of faith] the men of old had divine testimony borne to them and obtained a good report.